I really enjoyed doing a life update in very early June and have decided to try and get a post together about once a month. 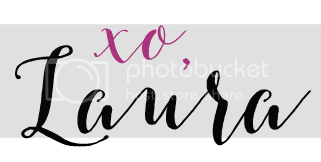 It's always fun for me to read these posts by other bloggers and I hope you enjoy reading mine as well! 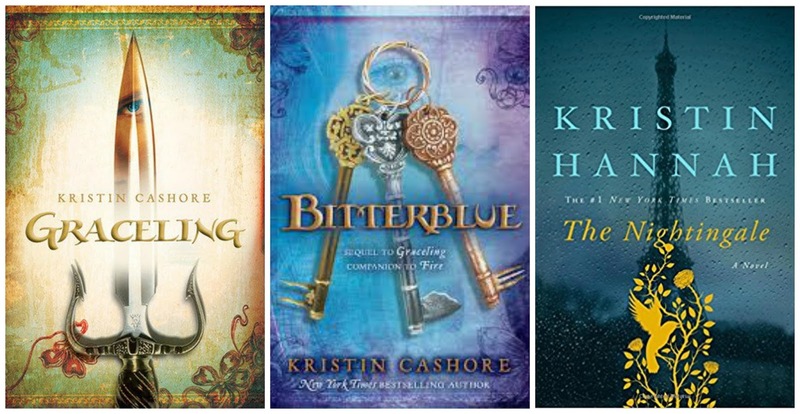 Graceling by Kristin Cashore- I got this for Christmas and finally got around to reading it. It's about a teenager named Katsa who lives in a world where some people are given a Grace, or talent for some skills. 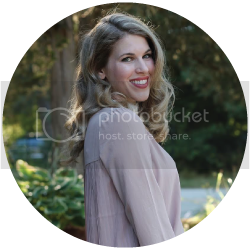 The book is about her learning to take charge of her life and her Grace and using it for good. I would say this is a fantasy book with a little bit of the feel of historical fiction. Katsa was an interesting character and I enjoyed seeing her grow into herself throughout the book. I enjoyed reading it! Bitterblue by Kristin Cashore- This is the sequel to Graceling. Bitterblue was in the first book and this book expanded on her story where Graceling ended. I don't want to get too much into the storyline because it would ruin part of the ending of Graceling. But I will say I wasn't impressed. I don't think the characters' personalities were consistent between the books. I felt Bitterblue was a stronger character in Graceling and she seemed completely naive about important subjects, too trusting of others, and wishy-washy with her decisions in this book. Sadly I wouldn't recommend it. There is a prequel/companion book to the series called Fire and I felt so let down by Bitterblue I didn't read it (which is pretty unlike me to leave a trilogy unfinished). The Nightingale by Kristin Hannah- I mentioned this in my last post and finished it this month. Oh my goodness. I cannot say enough good things about this book. The story is about 2 sisters and their lives during WWII. They are both amazing women in their own respect. I could tell how well the book was researched, great character development, and I like that the author stayed true to the storyline. I hate it when author's have characters go through something as horrible as war and then they are unscathed and their personalities unchanged. This was not the case with The Nightingale. I will definitely be looking for more books by Kristin Hannah in the future! Rhubarb Crumb Pie-My husband says this is a new favorite rhubarb dessert! I personally prefer the crumb topping to a pastry one. Mediterranean Meatball Gyros-These were so good! I made the meatballs ahead of time and they came together so easily! This recipe was definitely a make-again! Scones (but I added a 1/4c. of white chocolate chips and 1/4c. cherry chips)-so good with butter and jam! I was sent this for review through Brandbacker and have been using this for about 3 weeks now. If you've never heard of NeoStrata Skin Active, it is a comprehensive antiaging system of potent professional products with active benefit ingredients that work synergistically to address the broadest spectrum of visible signs of aging. The NeoStrata Skin Active system is made up of high-performance products, each formulated to deliver outstanding rejuvenating effects, including significant improvement in the appearance of deep wrinkles, crow's feet, sagging and uneven pigmentation. 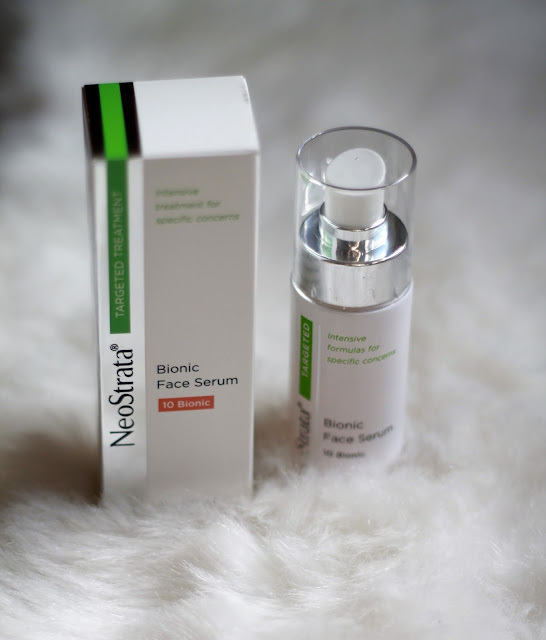 I was initially hoping the Neostrata Bionic Face Serum would help with the increased pigmentation I have on my forehead and cheeks, partially from past sun exposure and partially from pregnancy. It claims to help restore skin radiance and diminish the appearance of fine lines, wrinkles, pore size, laxity, and mottled pigmentation. My main skin concerns currently are pigmentation and trying to prevent fine lines and wrinkles. 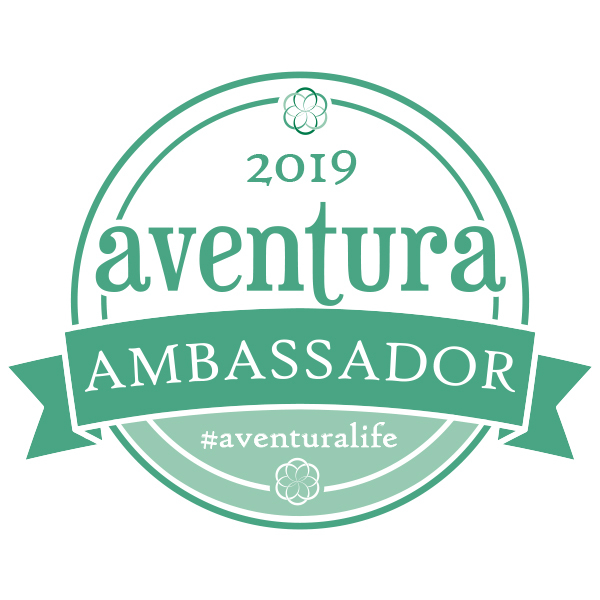 It is formulated with 10% Lactobionic Acid which is a potent antioxidant and Vitamins A, C, and E. It helps to provide moisturization and amplify the benefits of other anti-aging products you currently have in your regimen. I have been applying it once a day in the morning before applying additional serums and my moisturizer and sunscreen. This product can be used in targeted areas of concern or all over your face. I chose to use it all over to hopefully help see more of an effect. It is the same consistency as other serums I have tried and the pump dispenser makes getting the correct amount very easy. I just used my hands to apply all over my face. 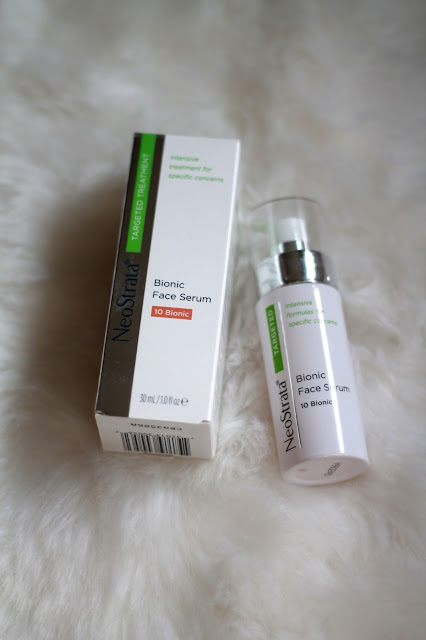 So after 3 weeks of using NeoStrata Bionic Face Serum, I have noticed some positive change in my skin. I don't think it helped with pigmentation unfortunately. I still see brown spots on my forehead and some on my cheeks. However, I do think it helped with fine lines and the appearance of pores, which I was pleasantly surprised to see. I feel my skin is more radiant looking, and that isn't just the pregnancy 'glow' (which I am not convinced is even a real thing anyway). And I think it has really helped decrease the expression lines I often get on my forehead and my smile lines, especially by the end of the day. Overall, I am impressed with this serum and plan to continue using it. I am hoping with continued use, I will see some improvement with pigmentation and continued improvement with expression lines and prevention of fine lines. It was easy and quick to use and I had no issues adding it to my current skincare routine. I also did not notice any issues with my skin reacting to it. I do experience skin sensitivity at times and was completely fine with this serum and had no reaction whatsoever. I actually think I was sent this by mistake instead of the product I was supposed to get for review. 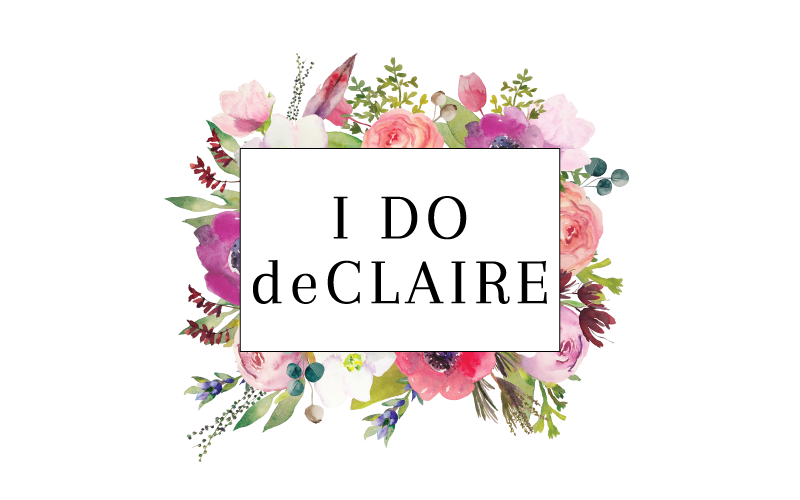 I don't remember signing up to review a cleanser, but it actually all worked out because I really like it so I decided to share my thoughts on it anyway. The Exuviance Purifying Cleansing Gel is an anti-aging face cleanser with Alpha and Polyhydrozy Acids to soothe and improve skin's texture. It is formulated with Glycolic Acid and Gluconolaone and deep cleans to remove impurities. It's designed to be non-drying and gentle to skin, including sensitive skin. On the website, it sells for $34 for 7.2oz. After using this a few weeks, I am a big fan! I love cleansers that remove makeup easily, even in the eye area, without irritating and over drying my skin. I am always good about removing makeup before bed, but I am not so good about adding the extra step of eye makeup remover. This does not say it tested by ophthalmologists to be safe for eyes, but it did not irritate my eyes at all when I used it to remove shadow and mascara. It has a wonderful fresh, clean scent I really enjoy. You only need a pea sized amount for your entire face, too. The price is a little higher than I would typically pay for a cleanser, but for the size of it I can see the value. This would easily last a couple of months for me. If you are on the hunt for a gentle cleanser, I would recommend giving this one a try! I am a big fan of Hask shampoo and conditioner and have tried several of their lines and always had a good experience so I was very excited to try HASK Dry Shampoo. 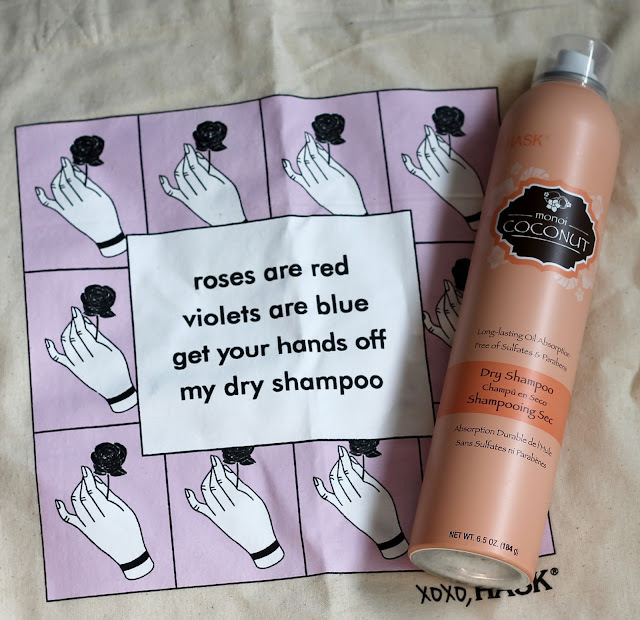 They sent me the Coconut Dry Shampoo and I love it! The smell is just amazing, but even better than that, is the absorption. It has long-lasting oil absorption and quickly absorbs excess oil. My hair felt fresh and clean after using this and stayed that way all day. I can often go 2-3 days between washes, but this extended that by a day easily. Definitely a great dry shampoo to try! Matt and I had the opportunity to go to a murder mystery dinner last week at the Astor Hotel in Milwaukee. It was put on by the Murder Mystery Co. and the theme was called Of Sound Mind and Dead Body. If you are in the Milwaukee area, the Milwaukee specific site can be found here. The murder mystery involves a lot of guest participation in which you gather clues throughout to guess the murderer, all over a 3 course dinner. I was so excited to get the email with the invitation to come. My husband and I love our date nights, but we aren't the best at planning them and actually getting out of the house on a Friday or Saturday night! This was exactly the push we needed and was a really nice change from our typical (and somewhat boring) dinner and a movie. The event was held at the historic Astor Hotel in downtown Milwaukee near the lakefront. It's a beautiful hotel with so much character and a great setting for a murder mystery! If you end up going to this location make sure to allow plenty of time for parking. With so many historic buildings in the area, there aren't many lots to park in. We were lucky to find street parking about 3 blocks away. When we arrived I was surprised at the number of people! There were around 150 guests. We all had mugshots taken as we entered and could use fun props. We had the VIP tickets so the photos were included and we were able to take them home. My husband and I had a silly one taken and then a nice one. It was a great memento to commemorate a fun date night! We were all seated at tables of 8, so we were with 3 other couples. We had a wonderful table that was a lot of fun and we were able to all talk pretty easily together. Each table had a person randomly recruited to be a character in the murder mystery which was a fun way to get the tables more involved. The person was given a book with instructions and clues that we opened as the mystery progressed. We also had 'bribe' money to get the other characters to answer our questions! There was an introduction with how it would all work and then the actual 'murder'! We had 3 opportunities to mingle with other table and ask the suspects clues throughout the meal and then we wrote down our guess for the suspect with the motive and opportunity at the end. Neither of us has ever done anything like this before and we both had a lot of fun! My husband isn't really into 'interactive' events like this, but he keeps saying how much he liked it and would go again. We were laughing almost the entire way through the performance between the actors and our table conversation! At the risk of giving my ideas away, I can see what a great gift a couple of tickets to this would be for some people I know. You can also receive a promo code for 50% off tickets by entering your email on their site (here). Their next performance in Milwaukee is in August and the same theme, but I will be keeping an eye out for when the theme changes! We are currently in Ireland! And having an incredible time! I won't be able to keep up with comments much, but I will definitely be reading your blogs whenever I have the opportunity! I got send these from 1-800-Flowers for an instagram collaboration, but couldn't resist showing them off! 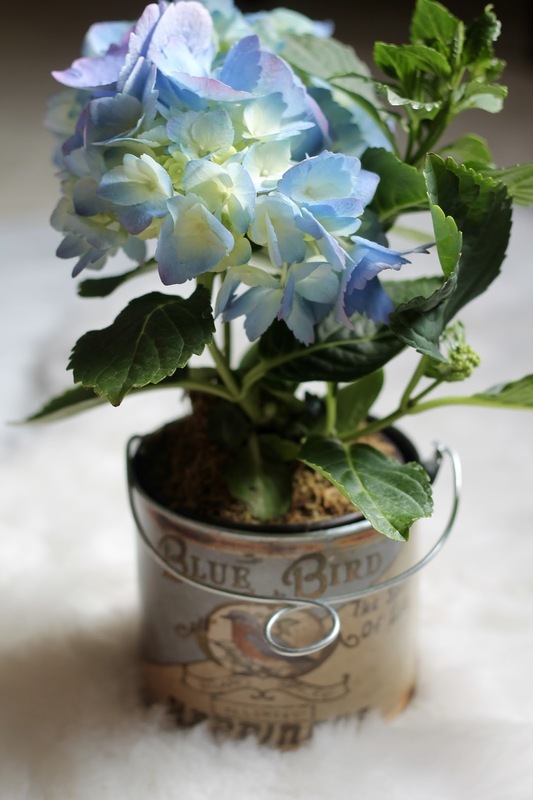 I love hydrangeas and cannot wait to plant these in our garden! Some of these products I received free for review, but all opinions are my own. Yay! I love posts like this! You've been so busy - as if blogging wasn't enough! Love the book reviews (The Nightingale really is so, so good!) and product reviews. The Mystery Dinner sounds so fun! And Ireland?! I can't wait to hear more about it! I just love The Nightingale, one of my favorite books! 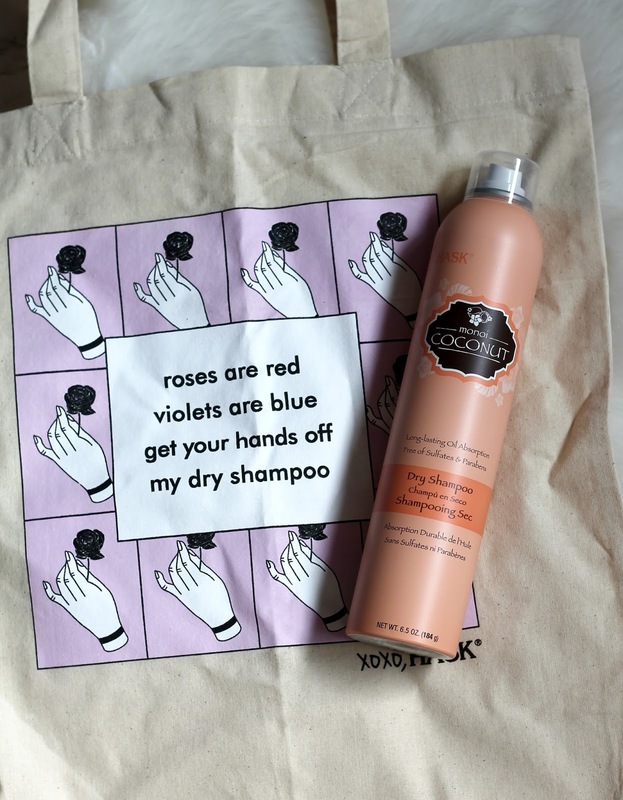 I would love to try the Hask Dry Shampoo, I love their hair sprays. I have never done a Murder Mystery Dinner, but it sounds fun! That's an adorable photo of the two of you! Your date night sounds like so much fun! I haven't done much reading lately and really need to get back into it. Thanks for sharing what's been going on. Can't wait to see your pics from Ireland. I need to try that shampoo and I would love to have the scones you made recently. I'm writing down The Nightingale for our book club!! And how fun you're on your vacation!! I can't wait to hear you share about it when you return, Laura!! The Nightingale is a fabulous read. And will be a movie soon. I went to a murder mystery party once and it was so fun! I ended up being the "murderer," haha. And I can't wait to hear about your Ireland trip! This sounds like so much fun. I've wanted to do this and maybe I'll put this on my year to do list! Have fun in Ireland! Sounds like a fun time! Those look like such good books!! I am intrigued by those cleansers. I need to check them out. I hope you enjoy you 4th of July celebration! A murder mystery dinner sounds like so much fun! Have heard of these dates before but haven't been on one. I think we might even have them available in lil ole El Paso. Sounds like such fun. Reminds me a little of dinner theater, which I always enjoy. You are just looking LOVELY! LOVELIER! So glad to see that baby beginning to round out your tummy. Exciting times. I love hydrangea, too. And what a delicate little arrangement you were sent! Thoughtful gift. Safe travels...Or maybe you are home already? If so, looking forward to photos from Ireland.